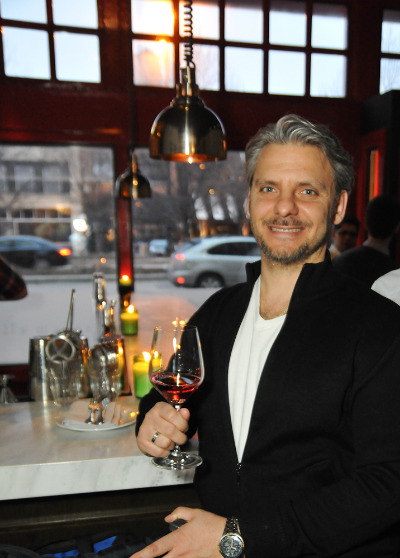 Just last week I had the chance to spend time with Apothic winemaker, Boyd Morrison, and other local writers & bloggers at GEB (Graham Elliot Bistro). I was really excited, as it was my first time at GEB, and I'd heard some great things, but was also here to try the newly released Apothic Rosé. Now Apothic is a wine which has taken Chicago by storm- I've seen it everywhere: in CostCo, Mariano's and everyone's kitchen! The winery is based in Sonoma and owned by E. & J. Gallo Winery with a purpose of blending likeable, epic wines. When I approached the bar, the GEB staff kindly poured me a glass of rosé and I was taken in by the sweet watermelon aroma. When I took a sip, I noticed the syrupy weightiness of the wine, along with loads of sweet fruit. This, like their white & red, was very likeable, especially for the price ($8-12). For an old palate like mine, I found it too sweet, but I also immediately recognized they aren't trying to reach me as a demographic. Boyd, formerly of Alexander Valley Vineyards, Jekel and Simi, informed me they'd been making a rosé for several years, but only for staff consumption. And, just like their recent release of red, is a blend of Zinfandel, Cabernet Sauvignon and Malbec. On to dinner. First course I had the Caesar which was simple, uncut and lightly slathered with a very garlicky dressing with awesome anchovy flavor. It was paired with the rosé, which is a popular pairing, though I prefer Sauvignon Blanc. It even works with the creamy dressing, because the acidity cuts into the mayo and egg, and the green tart citrus & berry matches most vegetables. Second course I had a lemon risotto which was tart and creamy, an awesome combo if done correctly (it was!). It was paired with the Apothic White, a blend of Chardonnay, Riesling and Moscato. The body and citrus was there for this pairing, and the two worked well. Third course was totally amazing- a tender, juicy, slow cooked veal breast with lightly macerated cannellini beans and pancetta vinaigrette. The beans crazily glued the entire dish together. Apothic Red was the pairing, and though I think it was a bit sweet, the body and smooth tannins proved a match. Dessert did not let down, as I had a mini banana split with salted pretzel and caramelized nuts at the bottom. Save room for this or the gianduja stuffed beignets!